Slightly off topic today, but I came across this little item over the weekend and it got me thinking. First: "that is the naughtiest bar tool I've ever seen." Seriously, think about it. Then the combination of calf-length black leather boot and high-kicking thigh set off other recollections of this particular look and how it's appeared past and present. 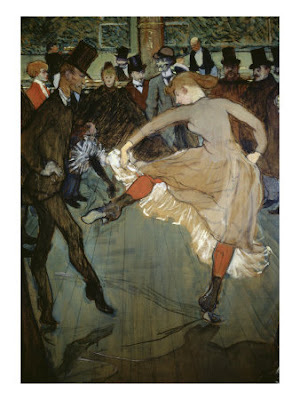 As in: Toulouse-Lautrec prowled the Parisian dancehalls, painted what he saw, and made their characters immortal. Below, a dance at the Moulin Rouge, where an lady gives a gent what amounts to a private show. When the can-can girls got on stage, the audience met with a lineful of short leather boots, petticoats, and little else beneath, most spectacularly when the dancers did the move known as the rond de jamb, in which the knee lifts high and the lower leg twists below. More recently the look lept from the dancehall to the burlesque stage, and to the Cabaret. Below Liza has ditched the petticoats but is still doing loads of ronds de jamb, this time with a chair as an excuse to get a leg over (YouTube won't let me embed the Mein Herr vid, have a look, it's amazing). Even more recently, pop stars looking to assume some old-school showgirl cred will likewise stick on some boots, limber up their hips, and work a chair, case in point the Pussycat Dolls in Buttons, below. Is it a look? It's a look. And considering its staying power, that corkscrew--even though it's an antique--won't be out of fashion anytime soon. A genuine curiosity... Nancy Sinatra drink your heart out! Your quote on The Sartorialist regarding maps for a child, lead me to your site: "Daffy on its face but true to the core. Which is pretty much Vreeland in a nutshell." I so agree! Loved both vids and Toulouse painting. Pussycat Dolls are hot, hot, hot. Liza's smoldering, clever, simple/sophisticated. It's a look I love delivered well in all 3 genres. Where can I get me one of them corkscrews? Thanks ladies! susan I'm going to have to take a good look at Nancy--her style must have been quite awesome, given all the connections. Shana I believe the corkscrew is still for sale, astonishingly. I'm on dial-up at the moment or I'd verify . . . thanks so much for the comments! Where can I find a replica of that corkscrew? I really like it.